Celebrated annually in September, Wyoming Archaeology Awareness Month (WAAM) consists of a series of statewide activities and programs devoted to discussing archaeological issues and to educating the public about the importance of preserving and protecting Wyoming’s archaeological heritage. The centerpiece of WAAM is the poster we produce every year. It is distributed statewide, nationally, and internationally to more than 5,000 people and organizations. 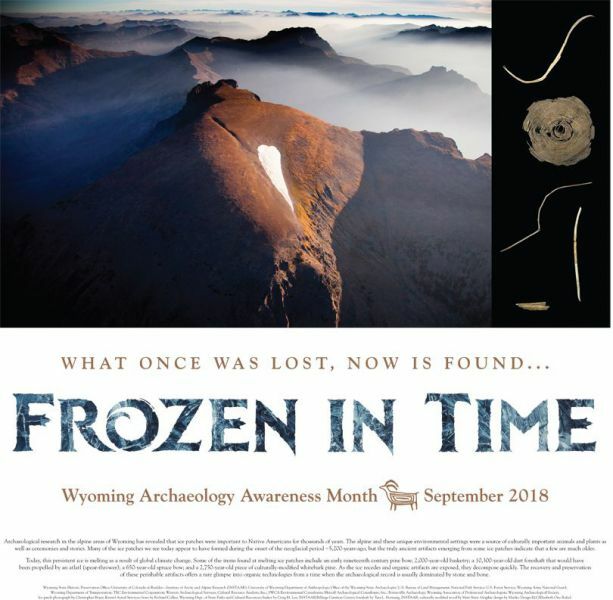 Wyoming posters have been honored with numerous awards in the State Archaeology Week Poster Contest sponsored by the Society for American Archaeology’s Public Education Committee and Council of Affiliated Societies. VIEW OUR AWARD WINNING POSTERS! Limit one poster per person. Posters produced between 2007 through 2018 are available. If you would like a poster mailed to you, a $12.00 charge is necessary to cover mailing costs. Please add $2.00 for each additional poster requested. For example, if you wish to receive the 2017 and 2016 posters, the mailing charge is $14.00. Dept. 3431, 1000 E. University Ave.